This week at Smith Gee’s DRT (Design Round Table, where one of our own teaches and shares with the firm weekly), Andy Berry made….I mean invited…us all to draw with sticks! “When I was in school, we used to draw a lot with sticks and ink. We’d use watercolor paper and a couple bottles of ink, go find a random stick or two, and get crackin’. The great thing about drawing with a stick is that you can make some cool (and often unexpected) marks on the paper. You give up a good deal of control when you draw with a stick. You can use a longer stick and hold it at the end to lessen the control even more. Drawing with a stick, the lines tend to be a little less accurate, which puts your focus more on the essence of the drawing rather than the execution of the detail. Architects spend a lot of time obsessing over lines and detail and drawing “actual” things, so it’s sometimes nice to be made free of those constraints so you can just draw. Drawing with a stick forces you to give in a little bit to the imprecision of the exercise. Another great thing about drawing with sticks is that unlike traditional drawing tools, you don’t have a seemingly endless supply of ink. You have to keep dipping! 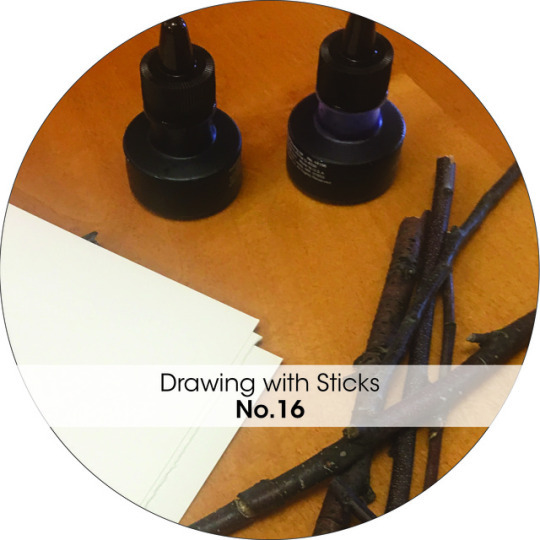 The drawing can get kind of blobby (depending on the diameter of the stick) – go with it. Turn that blob into something else after it dries. Or heck, turn it into something else while it’s still wet! And blind contour drawings won’t EVER look the way you planned – that’s kinda’ the point, plus you can always go back afterward and add more precise lines or color. Here are the results from this adventure!